WHITE AND GANNON RETURN WITH A NEW ENTRY IN THE STARFIRE SERIES, co-created by New York Times best-selling authors Steve White and David Weber. STAND AGAINST THE ALIEN INVADER APOCALYPSE! The war with the profoundly alien Arduans has ended, and the Arduans have come to call humanity their allies. Most of them—the Arduan warrior caste refuses to accept defeat. Now known as the Kaituni, they are waging a war of extermination against all members of the pan-Sentient Union, human and Arduan alike. What’s more, the Kaituni have an unexpected weapon in their arsenal: the alien Arachnids, once thought driven to extinction. The Kaituni drive the Arachnid fleet ahead of them, inflicting untold damage. The war has been marked by retreat on the side of the pan-Sentient Union. It seems the best they can do is minimize their losses. But now the Arachnids and the Kaituni are at the doorstep to the Heart Worlds, Sol, and Earth: Alpha Centauri. The odds look bleak. But Admiral Ian Trevayne and Commodore Ossian Wethermere have faced down long odds in the past. It’s time to take a stand, for Earth, for humanity . . . and for the pan-Sentient Union! Vietnam veteran Steve White is the author of numerous science fiction and fantasy novels including Wolf Among the Stars, St. Anthony’s Fire, and Blood of Heroes and the coauthor of Exodus, the immediate prequel to Extremis. With David Weber, White collaborated on Starfire series novels Insurrection, Crusade, In Death Ground, and New York Times bestseller The Shiva Option. 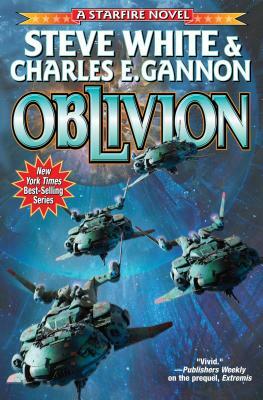 Charles E. Gannon is the author of Compton Crook Award winning, Nebula nominated Fire with Fire, Trial by Fire, and Raising Caine, in the Caine Riordan series. He is the coauthor with Eric Flint of 1636: The Papal Stakes and 1636: Commander Cantrell in the West Indiesin Eric Flint's best-selling Ring of Fire series. With best-selling Steve White, Gannon is the coauthor of Starfire series entries Extremis,and Imperative. Gannon is also the author of multiple short stories. He is a member of SIGMA, the "SF think-tank" which has advised various intelligence and defense agencies since the start of the millennium. Chuck lives near Annapolis, Maryland with his wife and children.